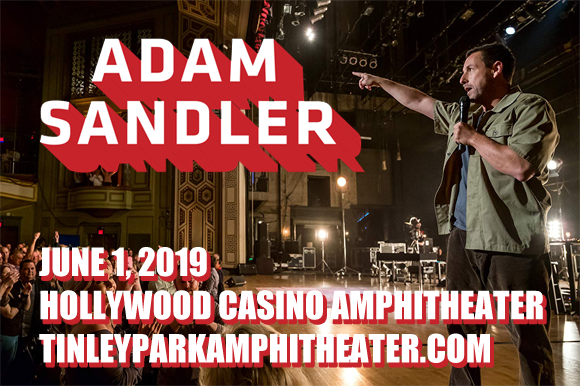 100% Fresh and 100% hilarious, Adam Sandler comes to Hollywood Casino Ampitheatre on Saturday 1st June 2019 on his first stand-up comedy tour in fifteen years! The 100% Fresher Tour sees Sandler bringing brand new material to the stage in the wake of last year's hysterically funny Netflix special, which proved once more that he is one of comedy's most talented stars! The veteran performer is on form and ready to rock – don't miss him! American actor, comedian, screenwriter, film producer, and musician Adam Sandler rose to fame in the early 1990s as a writer and featured player on Saturday Night Live. Having appeared previously as a recurring character on The Cosby Show in 1987, and appeared in the films Going Overboard (1989), Coneheads (1993) and Airheads (1994), Sandler had his first starring role in the comedy movie Billy Madison in 1995. His career continued to grow with starring roles in the wildly successful comedies Happy Gilmore (1996), The Wedding Singer (1998) and The Waterboy (1998). In addition to his continued success in comedy roles (Mr. Deeds (2002), and voicing Dracula in Hotel Transylvania (2012), Hotel Transylvania 2 (2015), and Hotel Transylvania 3: Summer Vacation (2018)), Sandler has also starred in several critically praised dramatic roles, in the films Punch-Drunk Love (2002), Spanglish (2004), Reign Over Me (2007), Funny People (2009), and The Meyerowitz Stories (2017). Combined, Sandler's films have grossed over $2 billion at the box office. He is also known for his stand-up comedy, having released two double-platinum albums (1993's They're All Gonna Laugh At You! and 1996's What the Hell Happened To Me?) and two gold albums (1997's What's Your Name? and 1999's Stan and Judy's Kid). Sandler returns to stand-up for the first time in fifteen years with his 2019 100% Fresher Tour!